Enjoy the best inspirational, motivational, positive, funny and famous quotes by Abraham de Moivre. Use words and picture quotations to push forward and inspire you keep going in life! 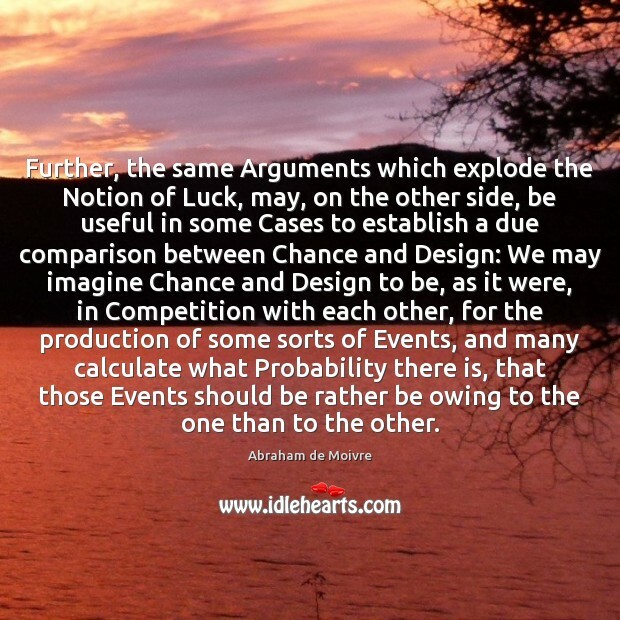 Further, the same Arguments which explode the Notion of Luck, may, on the other side, be useful in some Cases to establish a due comparison between Chance and Design: We may imagine Chance and Design to be, as it were, in Competition with each other, for the production of some sorts of Events, and many calculate what Probability there is, that those Events should be rather be owing to the one than to the other.